Depending on the scope and structure of the deal, and sub-sector specific considerations, each of these ventures is expected to create value for its parent companies in multiple ways (Exhibit 2). For example, in the onshore wind venture between Engie and Credit Agricole, Engie will benefit from access to cheaper capital, reduced capital exposure, and a possibly stronger balance sheet, while Credit Agricole will get relatively stable financial returns. In the cellulosic ethanol venture between DSM and POET, both parents will get access to the complementary technology, value chain capabilities, and market access of the other partner. The solar PV venture between First Solar and Belectric will help each parent fulfill their project pipelines by integrating First Solar’s advanced power plant systems with Belectric’s expertise in installations and project delivery. Enthusiasm and a positive long-term outlook for partnerships notwithstanding, there are a number of forces effecting a subtle change in the volume and nature of ventures, and in venture-related corporate governance strategies and structures4. The purpose of this memo is to introduce these forces and illustrate their impact. There are three categories of forces affecting deal volumes and values either upwards or downwards. Some of these forces are confined to a few sub-sectors, others are broader in influence. 1. Regulatory, economic, and technology environment. The alternative energy sector is exposed to a regulatory environment that is simultaneously challenging and supportive. Retroactive changes to government policies on subsidies, shifts from feed-in tariffs to auctions, and overall uncertainty around the continued availability of incentives, have deterred investments across all sub-sectors in Europe and North America. At the other end, motivated by growing power shortages, governments in emerging economies are actively courting investors through tax incentives, generous feed-in tariffs, streamlined permitting, and other support schemes. Relative venture volumes have accordingly migrated to Southern Africa, Asia, Latin America and Eastern Europe, which now account for more than 60% of total deals versus 40% at the beginning of the decade. Two dominant facets of the economic environment have provided a boost to the venture volumes and value; First, a downward pressure on interest rates that made projects easier to finance and attracted investors like insurance companies and pension funds with higher long-term returns than comparable market-based opportunities; Second, the availability of novel financing structures like partnership flips and yieldcos designed to appeal to investors chasing tax incentives or steady dividend streams. Activity in the technology environment has been centered on frontier technologies like offshore wind, concentrated solar power, as well as third and fourth generation bioenergy. Each comes with bigger capital requirements, higher uncertainty, longer gestation periods, but also a stronger growth potential seeding more and larger ventures. For example, offshore wind farms are two to three times more expensive to construct and operate compared to their onshore counterparts. In addition to their multi-billion dollar costs, project financing has historically not been a viable option5. Consequently, companies do not want to pursue offshore wind projects alone, and prefer joint ventures, where they can share the costs of funding on-balance sheet with their partners6. 2. Learning from experience. Over the past decade, companies have simultaneously progressed along three learning curves: the technology, market, and partnership curves. On the technology learning curve, companies no longer require partnerships to acquire and develop skills in solar PV, onshore wind, first-generation bioenergy, and other mature technologies. Accordingly, these technologies are producing fewer mixed-operator and 50-50 style ventures but more single operator ventures, where the partner is largely a contributor of capital, has basic protective rights, but maintains minimum involvement in the day-to-day running of the venture. Companies pursuing projects in these technologies are also more willing to take them through the construction phase without any partners and recapitalize them using financial investors at the operating stage. Solar PV can best illustrate the market curve. A rapid expansion in installations (initially triggered by government incentives) drove investments in production capacity. Resulting improvements in costs and commercial viability drove a further expansion in installations. This self-sustaining cycle created two byproducts; the first, a more distributed generation, and partnerships to access small-scale customers with a specialized approach to market development, sales, and servicing; the second, a more uncertain future economics, and partnerships to replicate the benefits of vertical integration and create a hedge against temporary supply-demand imbalances. Both byproducts have positively impacted venture volumes. Companies have also honed their experience in structuring and managing JVs. The defining feature of most early ventures in biofuels was over-optimistic projections to secure funding and sub-optimal deal terms to rapidly close deals (e.g., blanket exclusivity without performance penalties, asymmetrical exit rights). Many of these ventures subsequently failed to achieve commercialization targets, tempering the sub-sector’s overall enthusiasm for JVs. Technology developers, for instance, realized that a joint venture with a larger company does not guarantee commercialization at the pace they desire, and multiple non-exclusive licensing agreements or licensing agreements with different fields-of-use might be a better alternative. Correspondingly, large companies keen on acquiring exclusive rights to these technologies are considering outright asset purchases or contingent acquisitions, or they are settling for in-licensing arrangements. Companies in other sub-sectors have developed a deeper appreciation of JV-related challenges as well, including the potential for misalignments between partners (in areas like the pace and sequencing of new investments, the role of the Board relative to venture management, the suitability of parent-provided support and services, etc.). The result: a downward pressure on venture volumes in favor of deeper non-equity alliances, VC-type staged funding, and other non-JV structures. 3. Constraints and ambitions of key investor categories. 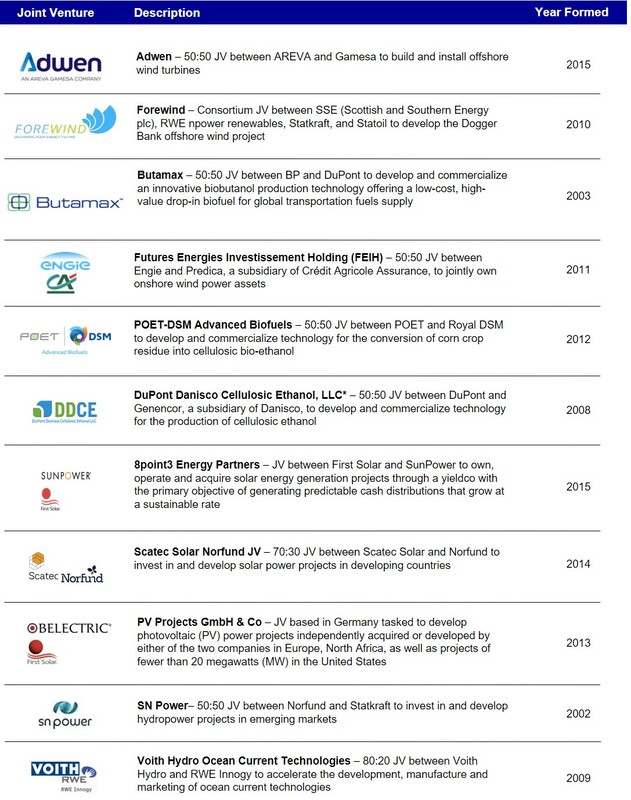 International oil and gas companies like BP, Shell, and Total were among the initial, tentative investors in the alternative energy sector (circa the late 1990s/early 2000s). Broader industry forces like the oil price slide ... Click below to download the entire article, including best practices. 1 See ‘Kingdom built on oil foresees fossil fuel phase-out this century,’ Financial Times, May 21, 2015. 3 The Paris Climate Pact, in committing countries to ambitious emissions reduction targets, will provide a further boost to investments and partnerships. 4 The views in this memo are based on our analysis of 500+ alternative energy joint ventures and other strategic alliances over the past decade, conversations with senior industry executives, and broader research. Additionally, Water Street Partners has developed industry-specific partnership datasets, which allows us to identify and track new ventures and build our library of creative deal structures. 5 Ratings agencies impute a larger risk to offshore wind debt because of the relative immaturity of the technology and refuse to consider project financing as non-recourse when calculating leverage ratios – negatively impacting the credit ratings of developers. 6 E.ON, Dong, and Masdar brought London Array (the $3 billion offshore wind farm in the UK) online after sharing construction costs on-balance sheet. Masdar had wanted to project finance its share of construction but struggled to assemble a bankable deal before the project’s completion. Lois is an Expert Director who advises clients on joint venture transactions and governance-related matters across a range of industries. She is responsible for benchmarking and other assessments that leverage Water Street Partners’ proprietary databases and repository of best practices. Lois joined Water Street Partners from McKinsey & Company, where she was a core member of the Corporate Finance Practice and worked extensively on issues related to joint ventures and other forms of alliances. Have a question or a comment? Enter it below and we will get back to you.